Rotary Chart Binder Carousels, Rhino-Tuff 5-Year Guarantee! Charts & Carts exclusive line of Rhino-Tuff chart carousels are the ultimate in fast action rotary retrieval of patient information. 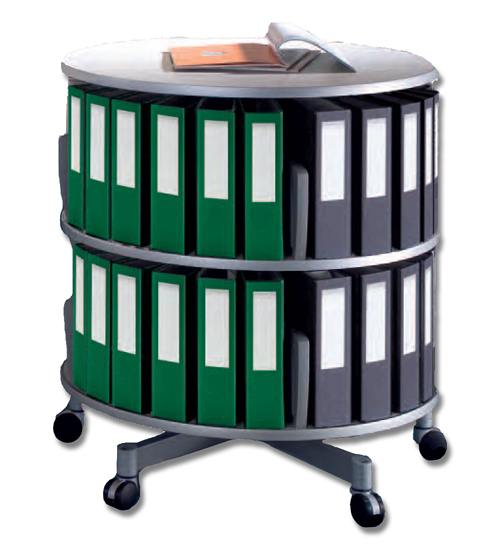 Patient binders are placed at your fingertips by simply rotating in either direction (360 degree spin). Ideal for hospital and long term care chart storage. Available as a floor model and as a counter top version for nursing stations. Contact the experts at Charts & Carts for personal assistance in determining the rotary chart carousel rack for your medical facility. SKU # EZBC-2, Our Best Seller! Choose from 2-5 tier heights! SKU # RTBC-060M, Rhino Tuff 5-Year Guarantee! SKU # RTBC-060CT, Rhino-Tuff 5-Year Guarantee! SKU # RTBC-030CT, Rhino-Tuff 5-Year Guarantee! SKU # RTBC-030M, Rhino-Tuff 5-Year Guarantee!